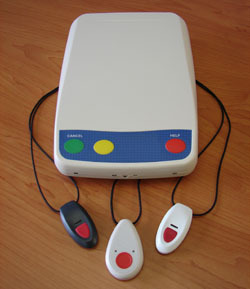 The VCi MK9 Personal Response System (medical alarm system) has been tried and tested in many tens of thousands of homes and in residential aged care accommodation. No programming is required at the time of installation and it is particularly suited to applications where all calls are received by a service provider. The equipment is supplied with a customer designed front panel label allowing customer branding and other specific information such as phone number etc. 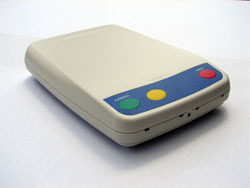 The current model, the MK9B, is the third revision of this very successful product and naturally meets, and in many cases far exceeds, the requirements of Australian Standard AS4607:1999, and all other Australian regulatory requirements. The VCi MK9 uses high quality components throughout and provides unparalleled levels of reliability and durability, particularly important when peoples well being depends on correct operation of the equipment, and when a service provider retains ownership and is responsible for its ongoing operation, maintenance and recycling. Using the very latest crystal stabalised technology, the Gemini pendant achieves significantly longer range in a very slim, attractive, and ergonomically designed package. Waterproof to the international Environmental Protection Standard IP67 so it can be worn in the bath and shower. Supplied with an internal lithium battery providing a very long service life (up to 10 years) without any need for battery replacement. Field programmed from the dialer or programmed from a simple office programming tool. 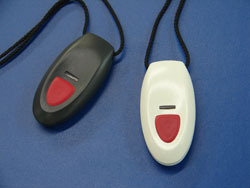 Supplied in white or black with a detachable neck cord. Certified to meet the stringent requirements of AS/NZ4268:1993 and complies with AS4607:1999. Supplied on 303.825MHz and compatible with all VCi products. Other frequencies may be available on request. High microphone sensitivity so response center operator can hear when client is some distance away. RS485 port on rear panel for field programming and connection of ancillary devices. Dual hardware and software watchdog timers continuously check for correct operation and blink light on front panel. Mains power fail, telecom line fault, low dialer battery, faulty dialer battery and low pendant battery all reported to service provider and indicated by alarm light to user. Dialer personality can be remotely reprogrammed by the service provider, or field programmable with a simple tool. 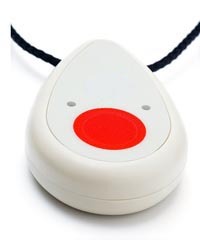 Pendant triggers designed to be waterproof to IP67 and can be worn in the shower or bath. The VCi Inline Receiver is now available to be used with the current MK9B and soon to be released MK10 Personal Response System (PRS). The Inline Receiver is essentially a remote receiver that connects via the built-in RS485 communications port located at the back of the PRS unit. The RS485 protocol is commonly used in industrial applications due to its resilience to noise, allowing the Inline Receiver to be strung out on long cable runs ensuring even the most difficult and hostile radio environments are covered. BenefitsUp to 4 Inline Receivers can be connected in series to the PRS unit. This is ideal for apartment blocks or industrial sites where there is a lot of metal work that can adversely effect and shorten radio range. The Inline Receiver is compatible with all VCi pendant, wrist and wall mounted triggers.